OK, redesigned pizza box isn't going to save civilization but every little bit helps (and I really like pizza too). Greenopia has released a cool list of coffees rated by their "greeness". "There are now a number of labels (Organic, Fair-Trade and Bird-Friendly are the most common) that keep track of specific parts of coffee's environmental impact, but when it comes to which companies are overall the most (and least) ecofriendly, little information was available. So Greenopia stepped up and rated 25 of the leading brands of coffee with our four-leaf rating system. In order to figure each brand's environmental impact, specific criteria were established by our research team. The team looked at sourcing, growing practices, packaging, sustainabilty reporting, transportation, production, and decaffination procedures to figure a rating for coffee companies." The True Patriot is one of those rare books that comes along none too often that screams something that needed to be screamed. An amazing read, it is a blend of classic American speeches from some of the greatest orators this country has known, and a call for a New American Patriotism. Liu and Hanauer declare that patriotism needs to be redefined, and then set out to do so, detailing their thoughts in a well conceived 10 part plan. With a belief that the right has co-opted the concept of what it means to be a Patriot and the left has abandoned it, they redefine what it means to be a strong American and ask of each of us to take part, and make the US the beacon that it can be, should be, and will be. This is a book that every American should read and a primer for anyone wishing for a stronger civilization as a whole. Available at The True Patriot Network. Wouldn’t it be great if every child born was guaranteed some financial security regardless of their socio-economic status? Modeling his Sky Trust on the same principle as the Alaskan Oil Trust, Barnes sets up a logical plan for ownership of the air by the common man (or woman). Instead of companies being allowed to pollute as much as they’d like, he suggests requiring them to buy those rights from the Sky Trust, the proceeds of which would go to the people. While this may seem far-fetched at first, give it a read and you may well find yourself a believer. And when your done, you can check out his website and buy your own share of the Sky Trust. Ever want to just step out of the rat race and live off the land as sustainably as is possible? Tyra and James Arraj did just that, leaving good paying jobs, a house and “civilization” behind as they moved to a piece of land they had purchased but knew little about. For the authors, it was a return to nature. This book follows their successes and failures as homesteaders and is a great lesson on the power of simplicity and understanding what is truly important. And if you ever wondered how to make your own tofu, it's got a recipe for that as well! 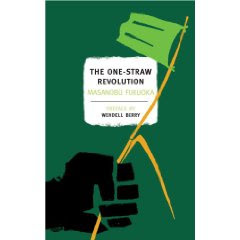 Japanese farmer Masanobu Fukuoka's case study for “do nothing” agriculture. While the book itself revolves around his farming practices, Fukuoka’s philosophies go far beyond the field and encompass our everyday lives and the need to return to nature. 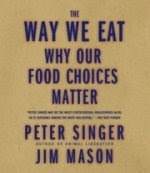 Singer and Mason have written an extremely compelling read on the foods we eat and the impact these choices have on our planet. They take three typical American families - one meat and potatoes, one “compassionate” meat eaters, and one vegan – and follow their food choices back to their sources. Don’t be fooled by the choices, they find out much more than what you’d expect, and what may seem like the best choice on the surface isn’t always the case once you look a little deeper. Be forewarned though, this book investigates factory farming and some of the reading is not for the faint of heart. Having said that, it is a compelling and eye opening read that will leave you thinking quite differently about the food chain and your place within it. 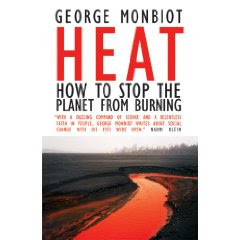 Considered by many to be one of the most important books ever written on Global Warming, Monbiot explains how we can beat the problems at hand and still live our lives. Calling for a 90% reduction in greenhouse gases by 2030, his plan is well thought out and his call to action is now. A must read for anyone concerned about the mounting problems of greenhouse gases. 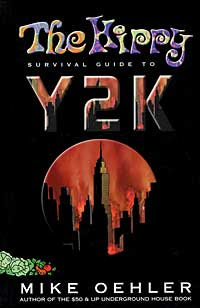 Another classic from my favorite mountain man, Y2K is broken up into two parts. The first follows Oehler’s 1999 countdown to Y2K. While it’s obviously a bit dated (and the end isn’t as much of a mystery as when it was written) it’s still a fun read. However, the second part of the book is where the real value is. Want to know how to catch and cook a squirrel in the city and what parts not to cook? Ever wonder what kind of wildflowers you can eat from your lawn? Oehler doles out a bevy of tidbits--everything a post-societal collapse survivor needs to know. While our hope is that most of this stuff is never necessary, it’s still good information to have and can really get you thinking. Available at UndergroundHousing.com. And while you are there, check out his novel, One Mexican Sunday. It's really good, and Oehler will sign it for you if you ask nicely. This is one of the more inspiring books I have come across about the importance of determination and sheer will in the face of adversity. Mortenson, a mountain climber turned goodwill ambassador who survived a kidnapping and death threats, single-handedly spearheaded a movement to build schools throughout Pakistan and Afghanistan, primarily for young girls who would otherwise have little hope of formal education. His clarity of vision, ability to work within systems that would destroy lesser men, and focus, prove that each of us has the ability to change the world. 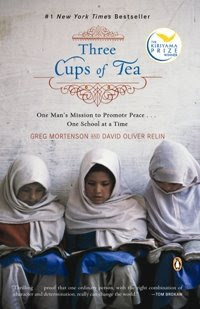 Available in children’s, young adult and adult versions through Amazon.com (7% of your purchase goes to the Central Asia Institute) and your local library. 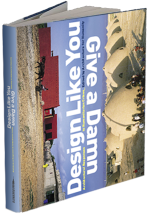 Available at Design Like You Give A Damn and your local library. The title says it all. This solid read is chock full of information on absolutely everything you’d ever want to know about sustainable solutions. The best part about it is that each entry is relatively short so you can sit down, open up the book, spend ten minutes being exposed to new ideas, and then move on. Think the title sounds overly optimistic? Pick it up and see for yourself, you may be surprised. 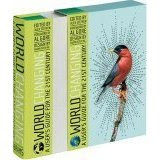 Available at WorldChanging.com and your local library. I've written on Better Place's battery swapping plan before, but since they've actually demonstrated it now, I thought it was worth another look. This link will take you to a 2 minute video of the "switching station" in operation. It's kind of slick, but I still have questions. When I first got my RAV EV in 2002, there was talk on the EV lists about how future EVs could drive across the country. One camp favored battery swapping, much like demonstrated here. The engineers of the group favored fast charging. Still others, actually it was mostly just Felix Kramer, who thought these "plug-in hybrids" were the way to go. Turns out he had the best idea, although all three ideas seemed plausible to me at the time. But since Better Place went to the trouble of building this thing, how well does it work? If you watch the video, it shows a Nissan sport utility vehicle driving into a small facility where a mechanized device unlatches the battery pack and replaces it with a fully charged one. The whole operation takes slightly over a minute, two minutes if you count driving into and out of the facility. Presumedly, payment is automated, so you never need to get out of the car, well, unless you gotta pee. That sure compares well with filling up a gas tank, but I still wonder about its feasibility. Consider that for this to work from a financial perspective, many, if not most car companies, would have to standardize the design of their battery packs so the same machine could replace packs on any vehicle. Given what I've learned about the auto industry these past 6 years, I don't see that happening. Also, the various car companies are cutting deals with a wide variety of LiIon battery makers and all of them are making their own specific type of LiIon battery. Each of these batteries has unique characteristics of voltage, energy density and power. From what the engineers tell me, the power electronics, or controller, is specifically designed to work with a certain battery, and that car or SUV will not be able to operate with just any old battery. Further, the economics of battery swapping are going to be very tough since all you're selling the customer are the 20 or 30 kWh of electricity stored in the pack. The U.S. average for a kWh is 10.4 cents. So, for a sale of $2-$3, only part of which is profit, the swapping station will have to purchase, charge and store hundreds of batteries of various kinds. These battery packs today cost $750-$1000/kWh, although some are saying they'll be down to $500/kWh soon and eventually down to $300/kWh. As daunting as that sounds, keep in mind that people who really want an EV that can go long distances will probably buy a PHEV Prius, Volt, Ford Escape PHEV or one of those BYD or Fisker Karma plug-in hybrids. And fast charging is quite viable as well. Aerovironment of Monrovia, CA has been making industrial fast chargers for over a decade. About 12 years ago, some of their engineers set out to see how far they could drive an EV1 in 24 hours, using a fast charger. They managed just over 1200 miles, a record that still stands. Of course, all the EV1s were crushed a few years later, so no more attempts were made with that car. The point being that viable alternatives to battery swapping exist today, and they will only get better, making the need for an expensive infrastructure unnecessary. So, while I'm happy that Better Place has demonstrated this battery swapping idea, I hope they don't spend a lot of time or money on the concept. Money that could be better used to actually get cars on the road. Better Place, a company working to build infrastructure for electric cars, hasreleased a video showing how its technology for swapping spent car batteries works. The video, taken from a demonstration on Wednesday in Yokohama, Japan, shows a white Nissan electric crossover sport-utility vehicle driving onto a ramp in a tidy, covered white station. Machines remove the battery from the bottom of the car and click in a replacement, amid whirring and clinking sounds. The company says that the entire process takes 80 seconds, though that’s difficult to verify from the slickly cut video. Better Place plans on beginning construction of more battery swap stations, which it calls “Switch Stations,” later this year — though unlike in the video, ramps will not be used in the future deployment of the swap machines, according to a Better Place representative. One hundred of the stations — which cost around $500,000 apiece — will be rolled out in Israel by 2011, with additional stations slated for Denmark and later, Australia, California, Hawaii and Ontario. Though it uses a sport-utility vehicle for the demonstration – not the greenest choice – the company said that it can recharge the batteries using solar panels, “creating a truly zero-emission solution,” according to an e-mailed comment from Sidney Goodman, a Better Place vice president. Follow filmmakers J.J. Beck and Joey Carey on a cross-country road trip powered by vegetable oil in a 1981 Mercedes-Benz. Interviews include Morgan Freeman, co-director of Earth Biofuels, along with Noam Chomsky, Yoko Ono, and Tommy Chong.